Video clip synopsis – Rare archival footage from 1910 shows camels carrying heavy supplies across the desert. 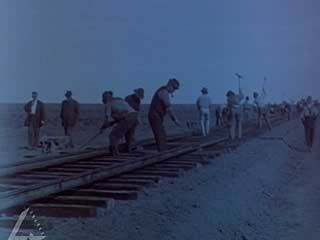 Railway labourers are building the 1400 km railway that will finally link Western Australia with the Eastern States. Broadband MP4 rail_bb.mp4 (3.1MB), suitable for iPods and computer downloads. 5.9 uses historical terms and concepts in appropriate contexts. Inquiry questions: What was life like in Australia at the turn of the century? Why was the completion of the railway an important event at the time – both socially and politically? Look at a map of Australia. Why would a railway linking Adelaide to Perth be considered to be so important at the time? human muscle of 3,500 men,and the labour of 750 camels and horses. In the clip what are some of the logistical problems mentioned that had to be overcome by the management and the men? The route the trainline took passed through areas where Aboriginal people had lived for thousands of years in virtual isolation. List some of the changes, both positive and negative, that the joining of the east and west of Australia in this way may have created for some Aboriginal communities. Prepare a speech by the Minister for Transport on completion of the first trip. What had been the significance of the trip? What did it have to do with nation building? What did it mean for Australia and for Australian identity?